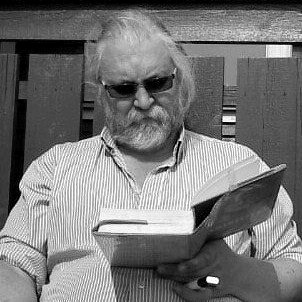 Author: Professor István KIRÁLY V. (PhD) , Babeş-Bolyai University, Cluj, Department of Philosophy, a member of the Advisory Board of the "Philosophical Views" and a Council Member of the "World Philosophy Network". Abstract: The study investigates philosophically the issue of human illness and its organic pertinence to the meaning of human life starting from the recognition that the dangerous encounter with the experience of illness is an unavoidable – and as such crucial – experience of the life of any living being. As for us humans, there is probably no mortal man who has never suffered of some – any! – kind of disease from his birth to the end of his life… Illness is therefore an experience or outright a danger of existence and its possibility, as well as a way of being that nobody has ever been and will ever be ontologically or existentially exempted from. So, it may well be “arbitrary” or “accidental” which disease affects which being or person, when and to what degree, in what way, etc., but it is factually unavoidable that in the course of one’s entire life – from its very beginning to its very end – one would never fall ill in some respect. The paper discusses this issue by the ontological investigation of possibility. Under the auspices of H.E. President of the Hellenic Republic Mr. Prokopios Pavlopoulos and of H.E. the President of the Republic of Cyprus Mr. Nicos Anastasiades, the World Philosophical congress on Aristotle, on the ocation of the 2.400 years from his birth was held from 9 to 15 July, at the Philosophical faculty of Athens. Congress organizers were The International Association of Greek Philosophy, the Greek Philosophical Society, the Philosophical Society of Cyprus and other Scientific Societies, Associations and Educational Institutions. At the Organizing Committee were: The President of the Hellenic Parliament Mr. Nikolaos Voutsis, The Minister of Education, Research and Religious Affairs Mr. Nikos Filis, The Head of the Region of Attica Ms. Rena Dourou, The Rector of the University of Athens Professor A.M. Dimopoulos, The Rector of the National Technical University of Athens Professor Ioannis Golias, The Mayor of the Municipality of Aristotle Mr. Georgios Zoubas. It was expected the participation of the most famous philosophers of the world, of which some had their lectures the next few congress days. They discussed the theme of the entire oeuvre of Aristotle's philosophy. According to Mrs Mpabaliouta Eleni-Vasiliki, press manager of "International Association of Greek Philosophy" the number of participants overcame the 550 scolars and researchers on philosophy of Aristotle. What was very characteristic for the present Congress was the large participation from China, Russia and Iran, a long the participation of Western scholars, mostly from Europe and USA. 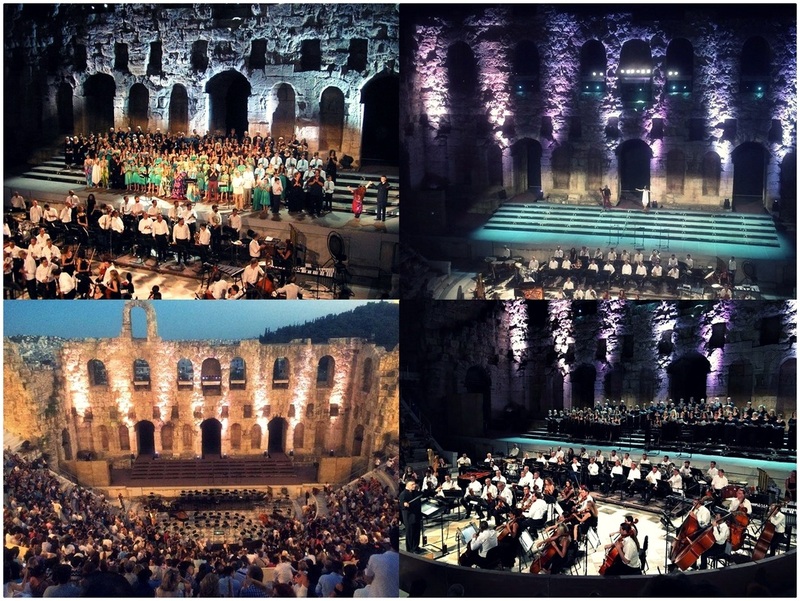 In addition to the philosophical expected special sessions and culture events such as the Official Openinig Ceremony which took place at the Odeum of Herodes Atticus at the first day of the congress. 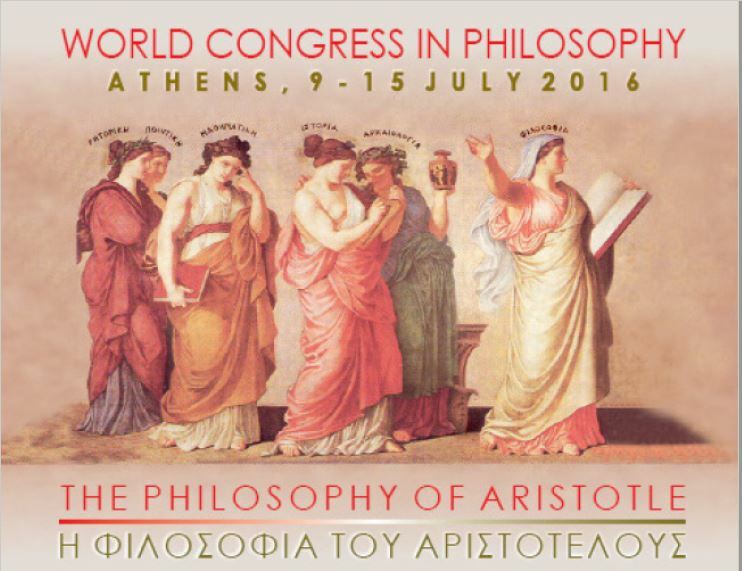 One interesting thing was that, on Wednesday, July 13, 2016 at 19:00 took place a particularly symbolic session at AULA, the theater of philosophy of Athens, the theatrical performance for the life of the philosopher Aristotle. Author and performer: Theodosis Pelegrinis, Deputy Minister of Education and former Rector of the University of Athens. As part of the celebrations throughout the world for the «Aristotle Anniversary Year» and the World Congress “The Philosophy of Aristotle”, which took place in Athens, Theodossis Pelegrinis’s play «Aristotle» was performed, under the direction of Nikos Paroikos. The play was staged with the support of the Cultural Organization of the Municipality of Athens (PODAN/ΠΟΔΑΝ). The play was performed on July 13 in the School of Philosophy of the University of Athens (AULA Amphitheater), for all Congress participants, as well as the public. The play will also be performed during a walk on July 22 and 23 in Athens; on both days, the walk will start at 7.30 p.m. at the entrance of the pedestrian way at Loumbardiaris Church (Philopappos Hill). Finally, the play will be performed during the closing ceremony of the celebrations for the «Aristotle Anniversary Year» at UNESCO premisses in Paris on November 18, 2016. The play concerns the philosophy of Aristotle. A troupe is rehearsing a play. During the rehearsal and at a moment of tension, a discussion starts between the director and his actors, on the role of the author and his play; this discussion is quickly extended to a very interesting and intense discussion on the basic issues of the Aristotelian philosophy. In this way, through the questions posed by the actors (a man and a woman), who ignore this philosophy or have wrong views about Aristotle, concepts such as catharsis, virtue, eudaimonia, morality, and many more, are touched upon and presented in a clear and comprehensible way and with the use of examples. The director teaches and guides the dialogical discussion with such a distinctive skill and power of persuasion that, at the end, the two actors realize their errors and get so troubled that they do not wish the rehearsal for the play they are preparing to be continued. Then the director proposes to them to go on a walk and to continue their discussion on Aristotle; the actors accept this proposal enthusiastically and this is how the play «Aristotle» comes to its completion. The play’s cast is: Theodossis Pelegrinis (director), Spyros Xenos (1st actor), Ilektra Paroikou (2nd actor). The official Closing Ceremony took place in the main Aula and the main yard of the School of Philosophy, Univerisity of Athens, on 15th of July, 2016. Dance companies “Kleigenis of the Cultural Centre of Ierissos” and “Mikto Chalkidikis – Folklore Centre of Polygyros”, under the direction of Ms. Ephi Keliaphanou will organize a party-celebration of Stagira and Chalkidiki. The companies performed, for the Congress participants, Invited speakers, Congress Guests, Congress Attendees, a representative sample of dance and music tradition of their area. The music orchestra “Ιχνηλάτες της παράδοσης” (The Trackers of Tradition) followed with their music performance. The reception organized and hosted by the Mayor of the Municipality of Aristotle Mr. George Zoubas for all Congress participants, Invited speakers, Congress Guests, Congress Attendees, will offer buffet meals from the Mount Athos, cooked by the famous monk Iosaf. The Mayor addressed the participants, providing them in his speech a unique picture of Chalkidiki as Aristotle’s homeland and land of Mount Athos. This year was declared as the year of Aristotle by UNESCO. The main initiative was submitted by a number of professors from universities in Greece, and also this initiative is supported by the president of the European Parliament Martin Schultz and by the state institutions of the Hellenic Republic. The first in a series of marking the anniversary of the birth of the famous philosopher took place in Thessaloniki under the name "World Congress Aristotle 2400 Years" at the initiative of the "Interdisciplinary Centre for Aristotle Studies" of the Aristotle University of Thessaloniki, as well as in his native place Ancient Staegira (Στάγειρα) in Halkidiki. The Congress was held from 23 to 28 May. Invited speakers were the most important researchers in the field of Aristotle's philosophy in the world, and one of them is supposed to be recently deceased Hilary Whitehall Putnam. Congress was full of great presentations and lectures on the theme of almost all aspects of Aristotle's philosophy beginning of political philosophy until bioethical learning of him. The cultural part of the Congress was marked with exclusive news about the discovery of Aristotle's grave on the Halkidiki peninsula. Aristotle was born in Stagira in 384 BC and died in Chalcis, Evia, at 322 BC. Greetings at the opening of the Congress was given by officials of the European and Hellenic Republic institutions. 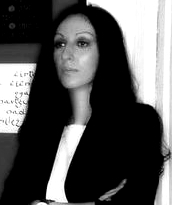 Special thanks to Mrs Mpabaliouta Eleni-Vasiliki, press manager of "International Association of Greek Philosophy"
Author of the text was press accredited journalist on both world events. At the time of St. Thomas Aquinas, it was not easy to understand other religions. Especially it is not because the spread of religion was associated with power and war. But exactly St. Thomas has the so-called "Pagan Doctrine" of Aristotle introduced into Christianity. In the eyes of many Orthodox Christians, this was an unforgivable mistake. With this doctrine has been the natural moral law in the Catholic theology introduced. But this reintroduction of Aristotle (if not as a revolution) in the Christian philosophy is still not done without obstacles. Chesterton says that St. Thomas corrected Plato with Aristotle, who has things taken so as he found them. Thomas takes also things so as they are created by God. Whether this theory is correct or not, it is very valuable to think that truth and faith cannot stay in contradiction toward each other, and at all, everything that a science brings to the world´s light, cannot be in contradiction to the faith. In the works of St. Thomas is always the world of positive creation at present. And to this history break was very helpful Aristotle, who was born just before 2400 years ago. In our work, we want to analyse the conditions of the Time of dialogue with Islam and Judaism as the focus for the summary of the Summa contra Gentiles, with an ideas of M.-D. Chenu, O. H. Pesch, J. Weisheipl, K. G. Chesterton and others who show us a picture of the not easily accessible but still encounter with other religions and also show the danger conceals in an inconsequent philosophy. Author: Sergey Kamenskiy, M.Sc. (Eng). In 2016 the Humanity will celebrate the 2400–year jubilee of Aristotle, the great Ancient Greece thinker, scientist and philosopher, who was the first to create all–embracing philosophical system, embracing and uniting all spheres of human development: politics, sociology, logic, physic. The series of celebrations dedicated to his 2400–year jubilee will take place all over the world, and Russia won`t be an exception. In October this year ceremonial events announcing Aristotle`s Year and popularizing philosophy in our country will be held in Moscow. Chosen as the central site of the festival was The Russian State Library (RSL). On September 27, at 20.30 the ceremony of solemnly opening the Aristotle`s Year in Russia will begin at RSL. It will be staged at RSL`s huge marble staircase where an atmosphere of antique amphitheatre would have been recreated. Right there, at the stairs, dancers, ballet artists and acrobats will be make their festive show, and well–known actors read the lines from not yet published and for the first time translated into Russian, works of Aristotle and his followers. Leading Russian philosophers and scholars – originators of “Aristotle`s heritage as the constituating element of European rationality” research project – will tell of unique findings of the great thinker, and philosophy`s role in our country. Following this, an international round table “Aristotle today: ethics, religion, medicine” will be held on October 29 at the Library of Russian Philosophy and Culture, “A.F. Losev`s House”. It is to gather leading philosophers, theologists and public figures from Russia and foreign countries. Besides, a series of open lectures will be held at Moscow. The scientists will tell of the riddles of antique philosophy and its links with contemporary world realities. A large city quest, various competitions and theateralized performances will be staged. In addition, a wide sequence of scientific events will be taking place in 2916. These were planned and scheduled by Russian scholars from the Institute of Philosophy of the Russian Academy of sciences, RAS` Institute of General History, The First Moscow Medical University named after Sechenov, and Novosibirsk State University. A detailed program of Aristotle`s Year will be at V.Kontakte and Facebook social nets` pages. An access to all events will be free. Aristotle`s Year Aristotle`s philosophy Russia, Russian Philosophy Institute of Philosophy State University in open access. Mpoitsis Ioannis, PhD candidate at University of Macedonia, Thessaloniki, Department of International and European studies. In the present paper I will try to connect the metaphysical aspect of Aristotle’s thought with his political one. I will examine the connection between the city and the cause and the concept of bliss (eudemonia) that Aristotle believes that is city’s high cause. I will also investigate why Aristotle believes that city should encourage citizens to act with virtue and why it so important for a democracy to have virtuous citizens. Finally I will present and explain the notion of metaphysics in politics. 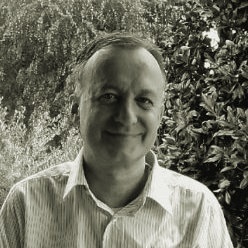 Stefano Ulliana, Laurea e Dottorato di Ricerca in Filosofia presso l'Università di Padova. Autore di testi filosofici. TRADUZIONE Inoltre, in che senso si deve intendere che le proprietà del numero e il numero sono cause delle cose che sono nell’universo e delle cose che in esso si producono dall’origine fino ad ora, e che d’altra parte non c’è altro numero fuori di questo numero del quale è costituito il mondo? Infatti, quando essi dicono che in questo dato luogo dell’universo si trovano l’opinione e il momento giusto e un poco al di sopra e un poco al di sotto si trovano l’ingiustizia e la separazione o la mescolanza e come dimostrazione affermano che ciascuna di queste cose è un numero (ma poi accade che in questo luogo del cielo si trovi già una moltitudine di grandezze riunite, per il fatto che queste proprietà del numero che le costituiscono corrispondono a particolari regioni dell’universo): ebbene, si deve forse intendere che questo numero che è nell’universo coincida con ciascuna di quelle cose, oppure che si tratti di un altro numero oltre questo? Platone afferma che è un numero diverso. Eppure, anch’egli ritiene che siano numeri e queste cose e le loro cause; egli, però, ritiene che le cause siano i numeri intelligibili, e che gli altri siano invece numeri sensibili. Abstract This article presents the idea of “symbiotic learning systems” as a possible strategy for dealing with institutional knowledge and learning challenges posed by an emerging transition from “socially monopolized” to “socially distributed” knowledge generation and distribution. 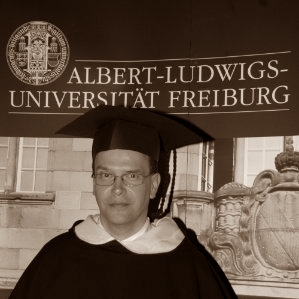 As knowledge production and learning become increasingly relocated from segregated and specialized institutions for research and education and socially distributed to and within “ordinary” work life, corresponding changes are required in the basic institutionalized relationships between research, higher education, and practical knowledge application. The concept of “symbiotic learning” addresses these problems by deconstructing age-old divisions between vocational and liberal education. In order to build foundations for a changed and improved relationship between advanced organizations in work life and institutions of higher education and research (HEIs), the general preconditions for learning in the work places themselves need to be addressed. In modeling general preconditions for learning, and even in transcending the division of labor between manual and intellectual work, inspiration is found in the philosophy of Plato and Aristotle, and in their search for intellectual “commons” (tà koiná) as constituting public spheres and community among individuals. The following text presents the idea of “symbiotic learning systems.” This idea has grown through several attempts to deal with institutional knowledge and learning challenges posed over the last half-century at least, on a societal level, by an emerging transition from “socially monopolized” to “socially distributed” knowledge generation and distribution (Gibbons et al. 1994; Nowotny et al. 2001; Eikeland 1999a, b). The emerging “new knowledge management regime” or “new mode of knowledge production” is characterized by increased global competition and technological change, increasingly knowledge based and competence intensive work life, new ICT and social media, highly educated workers at all levels, highly educated, informed, and critical users/customers/consumers, and increasing requirements in both private and public enterprises for continuous learning, research, improvement, development, and innovation. Both private and public organizations, at all levels, become increasingly populated by highly educated individuals. Simultaneously, advanced work life is often more “up-to-date” than educational institutions concerning technological and organizational solutions. It has been evident for some time that these new constellations challenge inherited hierarchical models of organization (like scientific management and bureaucracy), which are mostly based on a division of labor between thinking and planning in the higher organizational echelons, and mere execution of systemically predefined tasks by more or less unskilled labor on “the floor” of organizations. By challenging conventional conceptions of who learns what, how, when, and where, they also challenge traditional educational institutions. Simultaneously, from a different angle, challenges requiring similar solutions concerning validity and the relationship between theory and practice or theory and experience come from an epistemological and methodological perspective.1 In industry and business, the possibilities are explored of refining and upgrading practically and experientially acquired knowledge, tacit knowledge etc. as the basis for insight and understanding and for practical measures and innovations (cf. Nonaka and Takeuchi 1995), raising questions about who should (most appropriately) research what, where, how, when, and why. The new regime is gradually (and still, in spite of financial and debt crises) changing the institutional relations between research, education, and work life (Winter and Maisch 1996; Slaughter and Leslie 1997; Teare et al. 1998; Symes and McIntyre 2000; Levin and Greenwood 2000, 2001; Jarvis 2001; Slaughter and Rhoades 2004; Barnett 2006; McNay 2006; Levin and Greenwood 2008; Greenwood 2012).2 The challenges posed by these developments are comprehensive and fundamental. They concern much more than the conventional and simple tug of war between “scientific rigour” and “practical relevance” among different but apparently unchanged social interests, organizations, and institutions. The increasing dispersion of competence, knowledge production, and learning through society and work life requires the transformation of research, higher education, and practical knowledge application, making all three continuously less “ordinary.” The institutional and individual division of labor between intellectual and manual work is at stake. Before proceeding, I will briefly explain the term “symbiotic,” introduced in working papers (Eikeland 2005, 2006) in order to describe the proposed model of collaboration between learning organizations in work life and HEIs providing 1 Cf. Eikeland 1985, 1995, 1997, 2008a, 2009. The reflexive methodology of Alvesson and Sköldberg (2000) incorporates most of the recent discussions in the philosophy of social research. Still, they seem to remain within the confines and divisions of labor of interpretive or qualitative social research, and do not see the radical institutional implications. 2 Symbiotic learning systems may be seen as a version of what Levin (2004) calls “cross-boundary learning systems,” but where the boundaries themselves move and change education for professions. The term symbiosis is Greek. It may generate associations to biology and psychology. But here, the word bíos or bíôsis is used in a “prebiological” and “pre-psychological” sense. “Bíos,” (and even more so, “bíôsis”) in Greek, originally did not primarily designate abstract “natural life” as such, common to all living things, as in the modern discipline of biology. Rather, it meant “lifestyle” or “way of living” as in “bíos theoretikós” and “bíos praktikós” in Aristotle.3 A biological symbiosis is by definition mutually beneficial, which, transferred to this case, would mean, on the one hand, that symbiotic learning does not threaten academic freedom or academic standards, on the other hand that it will contribute to the improvement of individual and collective practice in organizations. Hence, symbiosis is used to mean some form of entangled or interwoven relationship and new modus vivendi from which all partners involved—those active in learning, research, and performance—will benefit. Hence, I conclude that “symbiotic learning” is an appropriate term for what is arguably needed between work life and institutions providing education for the professions (i.e., the field of vocational education and training expanded to include research based professions and semi-professions more generally).4 The basic aim of what follows is to suggest some general preconditions for individual and organizational learning in both academic and less academic work places, and to describe how this learning, in turn, is required for an improved collaborative and institutional integration of work, learning and knowledge generation, education, and innovation, making these relations more “symbiotic.” 5 Theoretically, the general learning preconditions sought for have been developed from explicitly philosophical sources in Plato and Aristotle and “the philosophical” bíôsis extracted from their texts.6 When work place learning as systematic organizational and individual self-evaluation is achieved, it can be used both for educational purposes and for solving immediate problems and challenges and improving individual and collective practice. It can articulate tacit knowledge and competence and disclose different perspectives and common realities, and finally, it can define emergent and long-term learning challenges and research questions without being limited to a search for what is instrumentally useful merely for immediate application or acute problem solving. Instead of reducing work-based or practice-based learning to problem or project based learning , symbiotic learning reinstates apprenticeship learning in a modernized version as its core. In practical terms, a central challenge is how to optimize and accredit the use of a presumed systematized method of learning and research in the work places as a basis 3 Ancient philosophy in itself was a way of life; a bíôsis, as emphasized especially by Hadot (1995). See Eikeland 1997, 2008a. 4 The point is not, of course, that “everything” should “always” be learned while working on the shop floor of some work life enterprise. The point is even less that everyone should only learn as much as is needed for shop floor practice or only as much as needed for solving some particular niche problem or challenge. University education cannot be reduced to conventional . The general point is rather that conceptual understanding is and must be developed as experience formation, in close conjunction between relevant practice and reflection. The general educational and learning model may be seen as a form of modernized apprenticeship learning model. 5 Cf. the call from CEDEFOP (2011) for an integration of training/education, work based learning/learning organizations, and innovation. 6 For detailed references to the texts of Plato and Artistotle cf. Eikeland (1997), (2008a). for providing formal professional education by the institutions of higher education, and for the benefit of both work places and academic learning. In order for learning in the work place to serve this function (and not remain subordinate to external research as it mostly is, for example, in the “evidence based” movement), it cannot remain unrecorded, and merely informal and serendipitous. It has to become more systematic and testable. The focus in what follows is on explaining the logic and organization of this type of learning. ​Being has been the central and dominating concept of twenty-five hundred years of Western philosophy. Ontology is the branch of metaphysics that concerns itself with the nature of being. In this sense it is at the core of metaphysics and is the central problem of philosophy. As Aristotle has put it: “That which now and always has been asked and now and always perplexes us is the question: ‘what is being?’ Aristotle did not use the word ontology, but called the study of Being: “First Philosophy”. The special sciences study Being “in some way”, το ον πως, whereas “first philosophy” studies being as being, being qua being, being as it is in itself; το ον η ον, or as Plato had put it before him, the being of being, το όντος ον. . First philosophy, therefore, is a science which is prior to all the other sciences and is therefore termed the science of sciences, επιστήμη επιστημών. The purpose of first philosophy, then, is to examine what there is, to ti esti. The whatness of a thing or its quiddity, its nature as a substance or essence, an ousia, was examined. First philosophy becomes an examination of the world and sets out to describe the familiar. In this sense, Aristotle’s ontology has been called descriptive metaphysics as opposed to speculative metaphysics which sets out to interpret the features of ultimate reality. One may ask what the purpose is in describing the familiar. If it is familiar, then we are already acquainted with it, are we not? The answer is that an examination of the familiar may prove surprisingly novel; the familiar may reveal heretofore hidden dimensions of itself. Indeed, the etymology of the Greek word for truth, aletheia, is “unhiddenness”. The truth is that which is not hidden, which is open to view and shines out , phainein, and is therefore a phenomenon, something which is seen and experienced, a phainesthai, which derive from phos, light. In this way, ontology was pursued by the phenomenological movement, by thinkers such as Brentano, Husserl, and Heidegger, who were seeking access to Being, to a radical level of experience, to the things themselves. What had been unproblematic for Aristotle, simply a description of the world around us, had become for modern philosophy an insoluble cluster of problems, a vexatious enigma consisting of the mind-body problem, the subject-object distinction, and the problem of solipsism. The starting point of these difficulties is the philosophy of Descartes with its methodological skepticism and hyperbolic doubt. Searching for a solid foundation for a method of inquiry, a ground of certainty or indubitandum, Descartes found himself in a position where he could only demonstrate the certainty of his own consciousness, his “I think”, the cogito. But how could he demonstrate the existence of his own body, of the physical world, and of other minds, if the only certainty was his thoughts. This cleavage between ego and world riddled modern philosophy until the challenge was met by phenomenological ontology. 2 For Heidegger, the solution to the problem lies in re-examining the point of departure. Here Heidegger is influenced by Husserl who like Descartes attempted to find certainty for philosophy and found it also in the Cogito, in the indubitable ‘I think’. But at this point Husserl breaks with Descartes. Husserl denies that Descartes’ Cogito established the certainty of a thinking substance, but only the certainty of consciousness. Moreover, says Husserl, consciousness is always of something, it is intentional, it is directed toward an object. The foundation on which knowledge rests is thus not the certainty of Descartes’ thinking substance, which is separate from the objects in the world, whose existence and nature remains questionable. Husserl’s foundation is consciousness and its intended objects; consciousness is not separate from the world but joined to it by intentionality. Heidegger takes from Husserl’s complex and formal philosophy the view of consciousness as intentional, a consciousness of something other than itself which it intends, to which it refers; and thus the conception of consciousness as relating to the world through its intentionality. For Heidegger, conscious existence is being-in-the – world; one does not begin from the standpoint of the ego but from the fundamental standpoint that man inhabits the world. Man finds himself ‘thrown’ into the world, finds himself in an already structured world with things ready to hand. An individual finds himself born in a specific historical and geographical milieu, dropped there as if from above. The investigation of Being must begin anew, Heidegger states, for the great tragedy of Western man is what he calls the Fall of Being, which is of biblical proportions, like the fall of Adam. Ever since the Greeks, Western man has lost contact with the nature of Being. The Greeks were closest to it, especially Parmenides, but the fundamental error in man’s relation to Being is a “turn’ away from it to the notion of Being as a thing, a reification of Being. “ Being is not a thing,” Heidegger keeps reminding us. Kant had said that the scandal of philosophy is that it has never succeeded in demonstrating the existence of an external world. The real scandal, Heidegger maintains, is that philosophers should continue to attempt such a demonstration, as if in answer to a genuine problem, instead of realizing that the problem only arises within an ontology that renders a solution to it impossible. As soon as we ask what it is that is demanding a proof of the external world, we see at once, according to Heidegger, that it is already a being-inthe-world. Only the impossible ontological presumption that questions about the external world could be asked by an isolated self enables the empiricist to suppose that the existence of the world could ever be a real problem. When man sets out to study Being, he notices that he is a being like all the other things out there. However, he is uniquely the one being for whom being is an issue. Man is the only being among the many beings that asks: “What is Being?” In this sense, whereas man and the other things are all beings, all ontic, only man is a being which, in addition to being ontic, is ontological. To be ontological is to be concerned with the question of being—not just to be, but to be a being for whom Being is an issue. The unique distinguishing feature of man is his existence which is characterized by his concern with being. The starting point of ontology, then, must be the features of man’s existence, an investigation of the ontological before there can be an investigation of the ontic. For the features of existence must be understood in order to understand man’s condition as a Being-in-the-world. Ontology therefore is necessarily an ontology of existence, a philosophy of existence. This puts man squarely in the center of things after the great speculative Hegelian systems of philosophy had relegated man to the periphery. The centrality of existence becomes a theme for literature after the excesses of the Romantic period. Heidegger’s seminal work Being and Time is an ontology of existence. And Sartre’s work Being and Nothingness is a response to Being and Time. 3 . Heidegger takes as his point of departure a passage from Plato’s Sophist—a passage which he translates as follows: “For you have long been aware of what you mean when you use the expression ‘being’. We, however, who used to think we understood it, have now become perplexed.” Heidegger agrees with Plato that everybody must in some sense know what he means when he says of something ‘it is’. But philosophy, Plato says, has become perplexed about the meaning of Being.. It is that perplexity which Heidegger hopes to understand and to resolve. Philosophy, he argues, must return to the problem of Being, a problem which Plato himself put fatally in the wrong light in so far as he identified Being with the Forms. For Heidegger, man’s existence is ontological. This is because man is a being that not only asks what is being and for whom being is an issue, but the being that is aware of Nonbeing. Man is a being that must die. Man is a being that knows that it must die. Therefore man is not only a being for whom Being is an issue but for whom Nonbeing is an issue. And not only is existence of concern to man. But it is so because of the everpresent possibility of nonexistence. As Heidegger puts it, Man is a “Being-towardsdeath”. This means not only that man must die but that he can die at any time. That he must die is his finitude. That he can die at any time is his contingency. Finitude and contingency taken together are the features of Being-toward-death. But man cannot stare death in the face. It is like staring into the sun. He will surely be struck blind. No, man averts his gaze. The truth causes dread and angst, what Kierkegaard called fear and trembling, and the sickness unto death. Anxiety is unfocussed fear, fear without a specific object that is the source of it. This metaphysical anxiety drives man into a modality of retreat from the truth which takes the form of triviality, of unthinkingness. Man falls back on mechanical behavior and idle talk to allay his anxiety. This is inauthentic existence. But occasionally circumstances intrude upon this dynamic, a death of a significant other perhaps, or a life threatening illness may cause a person to confront himself, to confront the void. Authenticity would take the form of the individual’s asking himself: “In view of the fact that I must die, and I can die at any time, what meaning can I give to my life?” That is to say, in view of the finitude of existence and its contingency, life can only have the meaning I myself give to it. Hence to ask what is the meaning of life is the wrong question. I can only ask what meaning can I give to it? Only then have I entered into authentic existence. At this point the question of ultimate reality is raised. Ultimate reality often refers to God. Heidegger calls his philosophy of existence: a temple without a shrine. The shrine is supplied by the individual if he chooses to posit it, if he chooses to make a leap to faith. In that sense his ontology of existence leads to a pre-religious state which may or may not be taken further by the individual in his ultimate subjectivity, as Kierkegaard had put it. Jean-Paul Sartre chooses not to take it. “We have lived through Auschwitz, we are no longer naïve” he says about religious belief. “No one lives there any more” is his literary echo to Nietzsche’s “God is dead.” But Sartre does take from Heidegger the basic distinction between the world of conscious being and the world of things; the concept of being thrown absurdly into existence; anguish and nothingness; the distinction between authentic and inauthentic existence; the distinction between facticity and transcendence; and the concept of man as making himself by having projects into the future. Sartre takes the standpoint of phenomenology, which rejects the endeavor of speculative metaphysics to inquire into the nature of ultimate reality. It rejects as unattainable the ideal of philosophy which Hegel represents, the ideal of achieving a unified view of the world out of theory of knowledge, the natural and social sciences, history, politics, religion, and art. Phenomenology rejects all forms of empiricism as well. Phenomenology for Sartre is the modest study of phenomena, of appearances in 4 relation to the structures of human consciousness through which they appear to us as they do. Sartre investigates being as it appears to human consciousness. Sartre agrees with Husserl’s view of consciousness as intentional, as intending or referring to an object. Consciousness is always of an object, says Sartre. Consciousness points to what is other than itself, to the whole world of things which are outside it and confront it as the ugly root of the chestnut tree confronted Roquentin’s consciousness, in Nausea.) In itself, says Sartre, consciousness is empty, nothing; it is a transparency, existing only as consciousness of some object. But Sartre agrees with Descartes that consciousness is always consciousness of itself; to be aware of an object is to be aware of being aware—or else I would be unconscious of being aware, and this would place consciousness in the power of the unconscious and of Freudian determinism, which rob consciousness of its freedom and responsibility. Consciousness is thus the starting point of philosophy; consciousness is intentional; and transparent; a nothingness. How then does being appear to consciousness? There are two absolutely separate kinds of being, two regions of being which appear with within consciousness. There is the being of myself as consciousness and the being of that which is other than myself, separate from myself, the objects of which I am conscious. This opposing region of being, the being of the objects of consciousness, the being of existing things—a pebble, a chestnut tree.. The things which are the objects of consciousness we regard as independent of consciousness, as independently real. Things are subject to causal laws and are causally determined to be what they are. They simply exist solidly, massively as what they are, like the root of the chestnut tree. Sartre calls this region of being being-in-itself, or the in-itself, en-soi. Conscious being Sartre calls “being for-itself”, or the for-itself, pour-soi. To be a conscious being is to be aware of a gap between my consciousness and its objects. It is to be in the world, and yet to be aware of not being one of the causally determined objects of the world. It is to be aware of a distance, an emptiness, a gap that separates me from the region of things. Sartre then argues that thee is such a thing as nothingness in the world and that it rises solely in relation to conscious being: it is only through conscious beings that nothingness enters the world. T o be a conscious being, to be a being for-itself is endlessly to bring nothingness into the world of being. What is Sartre up to? Sartre is trying to shed light upon the human condition and to show the crucial differences which separate conscious being from the causal deterministic order of things. In contrast with being-in-itself, conscious being is the realm of being which has the power to separate itself from its objects, to distinguish itself from the realm of things , to question, to doubt, to entertain possibilities, to be aware of lacks. But all of these— separating, distinguishing, raising questions, having doubts, thinking of possibilities or deficiencies—introduce a negative element into the world. They involve what is not, or nothingness. It is thus only in the distinctive capacities of a conscious being, a being for-itself, that you can think of what you lack, do not have, and what your possibilities are. Only as a possible being can you be dissatisfied with yourself, and desire not to be what you are now, and desire to be what you are not. This is the meaning of Sartre’s starkly contrasting definitions of being in itself and being for itself: Being in itself is what it is….the being of for-itself is defined, on the contrary, as being what it is not and not being what it is. 5 In all of these capacities on your part—your awareness of lacks, possibilities, unsatisfied desires, expectations of the future—you have been conscious of what is NOT the case, what is NOT present, what is NOT actual. You have been negating what is. And so, says Sartre, you have brought negation into the world. Sartre offers the now famous example of coming late to an appointment with Pierre in the café. To ask: is Pierre in the café? -- Will he have waited for me? -- is to open up the possibility of his NOT being there. It is again to introduce the notion of what is NOT the case, the notion of negation or nothingness. The café is full of being. But the massive solid being of the café is reduced to a mere background for the figure of Pierre that he seeks. The being of the café is made into nothing, it is negated, nihilated by the question: Where is Pierre? The judgment “Pierre is not here” introduces absence, the non-being of Pierre, nothingness, into the café. The necessary condition for our saying “not’, says Sartre with poetic intensity, is that non-being be a perpetual presence in us and outside of us, that nothingness haunts being. Moreover, says Sartre, nothingness, negation, nihilation is the basis of all questioning and of all philosophical or scientific inquiry. In asking any question about the world, the questioner is detaching, dissociating himself from the causal series of nature, the world of things. Only conscious being has the capacity to withdraw from the bare existence of things in the causal order, the capacity not to be part of that order—and introduce a gap, a void, a nothingness between consciousness and the realm of things. And so Sartre is able to make his dramatic conclusion that it is through man that nothingness comes into the world of being. Man presents himself says Sartre as a being who causes nothingness to arise in the world. “Man secretes his own nothingness.” At the same time, this nothingness is human freedom. To be a conscious being is to be free—free in relation to any particular object of consciousness; free from the causally determined world of things, free to negate –we are always free to say no. There is no difference between the being of man and his being free. Consciousness is totally free, undetermined and thus spontaneous. Since I am totally free my past does not determine what I am now, and what I am now does not determine my future. I am totally free, and thus I experience anguish at the giddy prospect that I am therefore also totally responsible. Sartre’s ontology constitutes a contribution and an advance on the classical free willdeterminism argument. The whole of Being and Nothingness can be seen as a cogent defense of freedom as the essential characteristic of human beings. One might have expected existentialism, stressing as it does the uniqueness and irreplaceability of the individual, to have been much exercised about the problem of his final destiny. But this is not so. It is typical of this stance to see death as final. We have already seen the important part played by death in the thought of Heidegger and Sartre. For them it is death above all that constitutes human finitude, and its prominence in their thinking lends a somber tone to their philosophies. It seems clear, however, that this question of the destiny of the individual is inseparable from the question about ultimate reality. If the universe is indeed absurd and godless, then there is no final destiny for the individual. But if the universe is a meaningful process in which God, Transcendence, or Being is realizing creative possibilities in finite beings, then it is reasonable to hope that whatever of value is thus realized will not finally be lost.dit.